Field 2 Private Investigator - CEO - CO.LIC#0000047. TX-A06260501. Jonathan Noel is from Austin, TX. After graduating High-School he was enlisted into the United States Marine Corps at the age of 17, Did 1 tour in Afghanistan as a Combat Logistics Operator as well as 10-15 combat logistic missions where he expanded and developed his leadership abilities as a Corporal of Marines. Before getting out of the Marine Corps in late December, 2013. Jonathan worked for a highly successful Private Investigation firm in Austin, TX "Watchful Eye Investigations LLC" as a Field Investigator for 4 years before starting CorpsElite investigations LLC in early 2014. 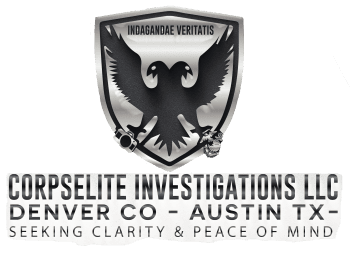 CorpsElite Investigations LLC is the 47th registered P.I. Company in The State of Colorado. C.E.I. operates & services more than 20-34 cases a week. Jonathan is highly trained in the arts of criminal psychology and state of the art surveillance techniques. Jonathan also holds a level 1 and 2 security license. Jonathan has also been trained and operates also as a certified personal protection officer and has implemented security techniques into the investigation aspect of C.E.I operations. Jonathan is the state certified manager of the Texas branch. Samantha graduated from high school in 2013 and continued on to college to study computer information systems. She has worked mostly in customer service and law office positions over the last seven years, and has recent experience skip tracing as a debt collector. Originally from the Iron Range of Northern Minnesota Anthony has experience as a Wild Land Fire Fighter, Class B Sawyer, and Incident Commander Trainee for the National Park Service. He has taught wilderness rescue, first aid, and GPS courses at the college level as Wilderness Rescue Specialist, and has served as a Certified Psychological First Aid Provider and member of the Disaster Action Team with the American Red Cross. Anthony holds 21 certifications between The Federal Emergency Management Agency (FEMA) and The American Red Cross in relation to the Incident Command System, National Response Framework, Disaster Services, Case Management, and Surveillance Awareness. He strongly believes in providing support and making his community a better place and has done so while serving as an appointed Commissioner on two local government boards. His academic achievements consist of a Graduate Certificate in Emergency Planning and Response through the Security Management program at the University of Denver with a 3.77 GPA, Bachelor’s of Science from the University of Minnesota with coursework in Criminal Justice – Terrorism, Crisis Communication, Legal Environments in Business, and Business Law, and finally a Diploma in Wild Land Fire Fighting with a certification in Emergency Medical Services. Upon graduation from high school in 2014, Zach put careful attention into the study of the mind. Immersed in the studies of Behavioral and Forensic Psychology at the University of Colorado Boulder, he has strengthened his skills in areas such as surveillance, reading behavioral cues and performing covert/detail oriented experiments. In addition to his enthusiasm for intelligence gathering, he also maintains a strict, goal driven attitude with professionalism. Dell has over 30 years experience in the field of electrical engineering and the detection of probes, bugs as well as the ability to pick up and detect internal modular listening devices that may have been placed and or implemented in: pov’s or (Privately owned Vehicles) Cellular devices, structural and or “Wall Bugs.” Dell is the B.S.T.S specialist or otherwise known as (Bug Sweeping Tech Specialist) for CorpsElite Investigations LLC. Dell has professionally and accurately served over and up to at least 50 special cases in regards to bug sweeping and counter electronic surveillance in any physical circumstance. Dell is a special instrument to the success of any and all cases that are proven to be difficult across the board of private investigations in regards to the technical aspect of “Spying” or “Gang-Stalking.” Dell spent 11 years working for “Dell Computers” “TECO Westinghouse” and other highly technical & formidable companies as well as graduating the top of his class with a much deserved bachelor's degree in electronic engineering among the experience Dell has already maintained at the University of Phoenix Arizona. Any device and or bug sweep case is considered to be a special case and is handled by Dell and his counter electronic surveillance team. Kyle grew up and graduated high school in Broomfield Colorado in 2005. After college at the age of 22 Kyle joined the United States Marine Corps where he held a variety of positions including Diesel Mechanic, Maintenance Floor Chief, Quality Control Chief and Marksmanship Instructor all of which allowed him to demonstrate his superior excellence in attention to detail and his natural ability to problem solve. After the Marine Corps Kyle was hired to work for the Army and the Department of Defense on Fort Leonard Wood in Missouri were he worked for two years. Kyle has lived in Missouri for 3 years. Kyle has 6 years of private investigation field experience and is an expert in Field Surveillance. Donovan Norris has 2 years of experience in field of surveillance as well as client relations and personnel management as a private investigator, making him an asset to all field operations. Donovan also went to UTSA (University of Texas at San Antonio) for international business practices expanding and further developing CorpsElite Investigations reach and or impact in the business market for private security. Donovan also spent time within the security industry as a level 2 security officer and personal protection officer. He is currently an active case manager for the Texas branch as well as Field Investigator in charge of intel construction.